Your smile is a vibrant instrument that plays the song of your personality. It’s a powerful tool—one that helps you effectively communicate, strengthen relationships and gain acceptance. At Grandview Family Dental, we believe that your smile is magnetic. But sometimes it may not measure up to your own expectations. If that’s the case, cosmetic dentistry empowers you to obtain the smile of your dreams. Veneers—A veneer is a thin layer of porcelain, which is placed over your tooth. It improves the shape, color and brightness of each tooth to which it’s applied—totally transforming your smile. Veneers are a popular option used by dentists to repair teeth that are worn, chipped, misaligned or irregularly shaped. They can also be used to close gaps. Use it on one tooth or all of your teeth! Professional Take-home Whitening Kits—Designed for use in the comfort of your own home, these professional kits are designed to whiten tooth enamel. The dental team will work with you to tailor trays that fit over your teeth like a glove. At home, you’ll squeeze the designated amount of professional whitening gel into your custom tray. Then simply place it over your teeth for the prescribed duration and frequency. Internal Tooth Whitening—If you’ve had a root canal, sometimes your tooth can become discolored. Grandview Family Dental offers an internal tooth whitening process to help you recapture your youthful tooth color. This process is performed in the dentist office by Dr. Dowhos and Dr. Kam. Implant Crowns—Missing a tooth? An implant crown can give you a full and vibrant smile. With an implant crown, an artificial root is placed into your jaw bone. A crown is then placed on top of the implant giving you a new tooth so you can proudly show off that captivating smile. 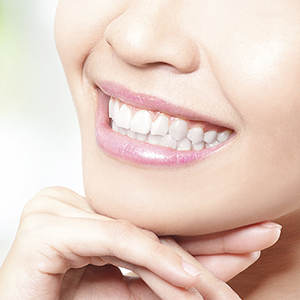 Discover what cosmetic dentistry can do for your smile.